NATIONAL Semiconductor, represented in Australia by Arrow Electronics, has introduced an integrated 100V pulse-width modulation (PWM) controller for forward converters with the active clamp/reset technique used in distributed power architectures. The LM5025 is designed for high switching frequencies and provides higher efficiency and greater power densities than conventional forward regulators in communications, automotive, distributed and industrial power systems and multi-output power supplies. The active clamp technique is one of the most popular single-ended topologies used in distributed power architectures. It allows operation at duty cycles above 50% and higher primary to secondary turns ratios in the power transformer. Deploying National Semiconductor's newest high-voltage (100V) precision analogue bipolar-CMOS-DMOS process allows the device to operate a wide input voltage range (13V-100V), eliminating bias regulator components and reducing the printed board area. National Semiconductor's LM5025 PWM controller integrates a 100V start-up bias regulator and a user programmable oscillator operating at 1MHz. It exhibits total propagation delays of less than 100ns, qualifying the device for an array of 48V communication isolated power supply applications. With the active clamp output, the LM5025 can be configured to provide either overlap time (for P-channel switch applications) or dead-off time (for N-channel switch applications). 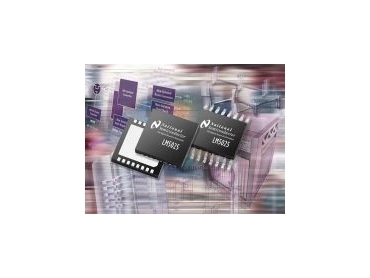 National's unique 3 A peak compound gate driver technology makes the LM5025 ideal for direct drive of a high-power MOSFET, reducing board space and leading to increased power density compared to alternative PWM controllers that require the addition of a gate driver chip.